Like so many prior arrivals on the educational scene -- lectures, seminars and case discussions among them -- management games are here to stay. This statement can now be made without any doubt; yet there continues to linger in the minds of many much doubt and many questions concerning the functions, construction and effects of games and their proper place in various curricula as well as in research. The present work makes no pretense at answering all questions or trying to allay all doubts. However, in this introductory chapter we shall discuss basic problems of application and design in a manner which may assist the reader with less practical experience of gaming to form his own reasoned views. 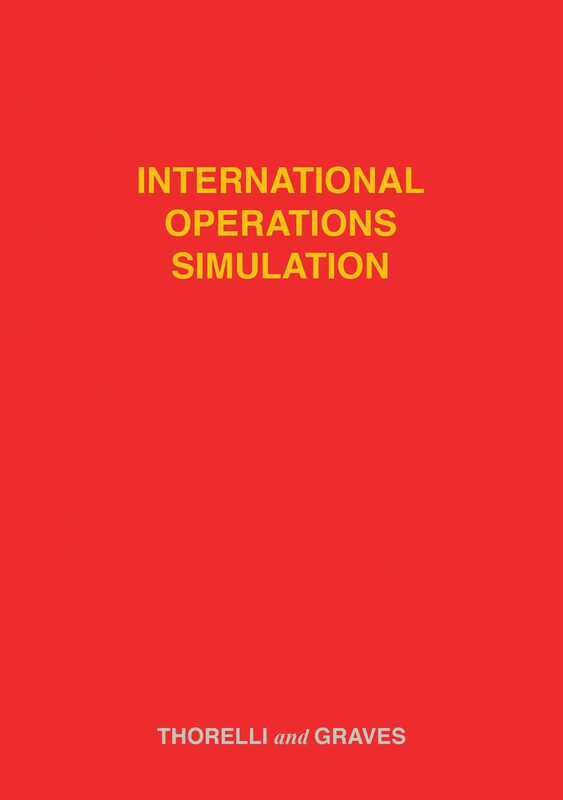 Later chapters are devoted to the International Operations Simulation (INTOP), representative of a small but growing class of fairly complex general management games which we consider particularly suited to executive development in corporations (particularly but not exclusively those engaged in international business), to business school training at functional as well as general business policy and organization levels and to a variety of research and business planning uses. Games as simulation and training devices originated with the military, who for several decades were the only interested party. The last fifteen years have witnessed the emergence of business games as well as diplomacy and international relations games, and simulation by gaming is rapidly finding many other applications, ranging from the planning of state university systems via city governmental affairs to the determinants of public opinion. No particular degree of familiarity with these developments is required here; neither shall we attempt a systematic analysis of an already oft-surveyed and rapidly burgeoning literature. Pointers from our own experience as participants in and administrators and designers of management games will, however, be used to highlight the discussion. Games represent a form of simulation. The concept of simulation is not without its ambiguities in either popular or scientific parlance. We find it natural and useful to think of simulation as "a technique for studying the behavior of complex systems." Thus, it involves the use of a model of reality comprising a bundle of interrelated variables, and the manipulation and/or observation of the behavior of this system over time. More often than not it is impossible to represent in the simulation all variables at play in reality and to assign them their proper relative weights. The proximate test of the value of simulation is whether by such means we increase our general understanding of the real system; the ultimate test is whether simulation permits us to predict developments in the realistic situation with greater accuracy. Games are generally designed to meet only the more modest of these tests; that is, they purport to portray reality only in a broad and general way. In this one respect management games resemble the classical economic theory of the firm, although the more complex game simulations at least incorporate a great many more variables, economic as well as institutional, than one would expect to find in any model based on that theory. Game designers usually have not been interested in building a "computerized copy" of reality in any given industry, and we think for good reason. At least at the present stage of the art, the number of variables and the complexity of interaction involved generally speak in favor of highly specialized, non-game models for this more sophisticated but typically also more narrowly applicable species of simulation. For a more detailed discussion of the purposes of business management games -- and we shall focus on such games -- it is convenient to distinguish three somewhat separate areas of application, namely, education, research and business planning. In the area of education three major types of purposes may be distinguished: to increase the student's understanding of business problems at the functional level (marketing, production, etc. ), of the inescapable interrelatedness of the functions and parts of a business and of the various firms in an industry, and to broaden the grasp of, and provide some practical training in, the problems of organization, policy and decision-making processes in general. Many games are designed to provide exclusive or special emphasis on a certain business function, such as marketing or finance. In these simulation exercises students get an opportunity to grapple with such functional and sub-functional problems as market research and forecasting, sales management, pricing, physical distribution, advertising, or investment policy, procurement of financial resources, budgeting and financial control. While the details of these problems will differ from any specific situation facing the students in real life, the principal elements, their general linkage and their dynamics will be sufficiently similar to offer the students a taste closer to "the real thing" than that of almost any other potion educators are in a position to offer. Even quite simple game models do show up the inevitable interconnectedness between various parts of business. The risks of narrow-minded specialization, "localism," and suboptimization are usually demonstrated quite forcefully and in surprisingly realistic ways. Judging by our experience in the Executive Program of the Graduate School of Business at Chicago and by information from several corporate development programs, this facet of business games seems especially pertinent in training at the middle management level. The more complex games will do what the simpler games do in the functional and inter-functional areas. In addition, they are generally vastly superior instruments for top management and leadership training in general, due to their automatic emphasis on problems of organization, policy and decision-making processes. The number of decisions to be made, and the amount of information processing required for reasonably intelligent decisions, is so great as to confront the teams with the urgency of a sensible division of labor, the desirability of long-range planning and the merits of applying a variety of techniques of management analysis such as cash-flow budgeting and rate-of-return analysis. The team leader is given an excellent opportunity for sensitivity training, and for all members an experience in group decision-making and action is provided in which they get a chance to observe and improve their own "style" in an informal, if rarely relaxed, organized interaction context. An incidental payoff of participation in a complex game is that it forces players to learn how to live with computers. Whatever the effects of computerization in business will be, we will see more of it. Team members will learn, usually the hard way, that generally speaking computers are characterized by inexorable logic paired with complete lack of judgment. It turns out to be quite a strain on untrained minds to write computer instructions and decision rules under these highly realistic constraints. There can be no doubt that management games hold a vast potential as instruments and settings for research. This is especially true in two fields, economics and marketing constituting one and organization theory and behavioral sciences the other. As to economics and marketing, the discussion about the most efficacious research applications seems to have swung like a pendulum between two extremes. Some persons seem to think that designing game models resembling as closely as possible the constructs of classical economics is highly desirable, presumably with a view to "check out" these as a prelude to their ultimate application to real-life situations. Apart from the nagging question of whether we can ever hope to transplant an essentially static theory into something practically applicable even in a highly structured game environment, there is the challenge of using a new instrument of research inductively rather than deductively. In other words, by incorporating institutional and behavioral features of real-life markets into our game models, we may begin to learn things about the relationships between market structure and market strategy that in a new light, which is sorely needed. ?? ?we never knew before. At least we may begin to view these relationships. Several other avenues of economic research suggest themselves. One might try to gauge the impact of changes in public policy -- especially with regard to antitrust and tax legislation and international trade policy -- in terms of both aggregate effect on behavior and reaction times. It is further most likely that our understanding of decision-making under conditions of uncertainty and risk will be increased by experimentation with varying degrees of such conditions in controlled game situations. Certainly such endeavors would represent a marked step forward from most highly artificial and simple experiments in gambling and choice behavior of the past. There are also the great new vistas opened by the emerging behavioral theory of the firm, which focuses on the impact of institutional and organizational factors on business decision-making within firms. There is already enough empirical evidence at hand to assert with sublime confidence that the organization structure and information-handling processes of the firm greatly influence its specific decisions in such vital areas as price, output, equipment acquisitions, advertising and so on. Here we find the vital cross-link from economic theory to organization theory and behavioral science. Simulations may also find applications in research aimed at the industry rather than the firm. Thus, some of the more sophisticated games could well be used in elementary simulations of market structures of widely different characteristics as regards production and demand functions, degree of competition and number of participating companies. The research opportunities presented by management games in the area of organization structure and behavior seem almost unlimited. Again it must be kept in mind, however, that only games with a certain minimum level of complexity will meet the criterion of reasonable realism, both in terms of portraying real-life institutional and economic conditions and being conducive to realistic division of labor among team members. If these conditions are fulfilled, a myriad of research projects which have been carried out under the common label of "small-group research" may be replicated in an environment which in many instances would represent a clear-cut advance in degree of realism. If the results achieved under small-group laboratory conditions stand up in experiments repeated in complex games, this would seem to support at least a preliminary rebuttal to the argument that what we learn in the small-group laboratory may not be at all transferable into the realm of reality. Game simulation may also be used heuristically to generate new hypotheses for research on actual organizations. Some of the most interesting research perspectives are now opening as regards formal organization and the interaction of formal and informal in organization. Under what circumstances in terms of personnel, objectives and environmental conditions should structural elements emphasize purpose (product), clientele, function and/or geographical area? What environmental circumstances favor delegation of decision-making authority? How are structure and behavior influenced by variations in accounting systems? What are the characteristics of those groups which will stand up better under time pressure than others? What is the effect of a new member on an on-going organization? How will various restrictions on information flow affect team performance? These are only some of the many questions which we may hope to shed new light on. The psychologist, the sociologist and the organization theorist alike will be interested in exploring the emergence and exercise of leadership in initially unstructured but heavily task-oriented groups. By changing parameters in terms of the game task environment, number and composition of team members and their assignments, we may also gain new insight into what is really meant by the assertion that leadership is largely situationally conditioned. While it is certainly premature to make definite statements in this regard it is also likely that certain types of personality tests based on performance in management games will be developed. Bargaining and game theory constitute another research area of multi-disciplinary interest in which simulations permitting meaningful inter-team transactions hold great promise. Simulation-based research may, for example, help test the hypothesis once propounded by Harold Guetzkow that the more adequately the members of a group envision the techniques of inter-group collaboration as means to their ends, the greater the tendency to move toward collaboration. Clearly, our brief survey has suggested only a few of the great many research opportunities presented by management games. It is also clear that most or all projects suggested could be carried out by alternate means. Some can, and undoubtedly will, be executed on real-life businesses, in which case the question of realism, at least, need no longer bother the researcher. But research on real-life organizations, especially if it involves experimentation, is generally extremely costly -- costly in terms of time, in terms of direct expense involved and frequently also in terms of upset or disturbed human relations. In all these respects working in the game environment represents a distinct advantage. On the other hand, a sophisticated management game has the advantage of much greater realism (subjective if not objective) than the simplified situations employed in much small-group research in the past. Considering the vast potential use of management games for research purposes, one may legitimately ask why the accomplishments to date (even including the respectable work at Carnegie Institute of Technology) are but quite modest. A number of reasons explain this situation. The most powerful one is probably that these games are so new. The main effort of researchers in the past has been to conceive of game models and then to try to make them work. The latter part of the effort is not to be underestimated, as making a complex game of the type needed for much economic and organizational research really "fly" will often involve several man-years of work by highly qualified people. Neither can we lose sight of the fact that the prime motivation behind the development of new games in the past has been their use for educational purposes. An often heard observation on the campus is that the exigencies of educational application will tend to hold back the use of games for research in the absence of a clear-cut policy to the contrary. The third major area of application of management games is business planning. For present purposes it seems natural to look upon this as an area of applied research, as opposed to research of a more fundamental nature just discussed. Again, a distinction seems useful (even if in the end artificial) between simulation of markets and economic systems on the one hand and administrative systems on the other. Simulation of the former kind typically aims at the examination of alternate specific production, finance, marketing, etc., policies of the firm under game environmental circumstances which in some important respects portray real markets. An excellent example is the PittAmstan Simulator, a game patterned on the distribution of plumbing and hardware supplies. Participants seek to achieve an "optimal" allocation of their resources in vying for the trade of several hundred individually designated customers with different needs, trade status and buying criteria. While the variations between various customer groups in the game has always reflected the diversity found in actual markets in a general way, we understand that the "Simulator" is now being modified to incorporate all "relevant" characteristics of all individual Amstan customers. For the near future at least management games as instruments of business planning are likely to find even greater use in the simulation of administrative systems. A number of production scheduling and inventory management games already illustrate this. However, we are also thinking of such major problem areas as overall organization structure, information processing and communications procedures. This point is discussed at some length in A Note on Organization Simulation by Gaming in Appendix VII. The beginning made in utilizing management games in business planning is even more modest than in the area of more fundamental research. The two areas may be expected to feed into each other in a cumulative process in the future. Meanwhile, the greatest and probably most lasting value of simulation by gaming in business planning is that it affords management a fast and relatively low-cost opportunity to try out new ideas on a preliminary basis in a non-committal setting, and in doing so to uncover a number of unforeseen factors and ancillary ideas which should be taken into consideration in making the original proposal a more viable one when ultimately translated into practice. A great many types of management games may be distinguished by purpose, manner of play and mode of administration. We have just discussed the fact that from a general point of view business games may serve educational, research or business planning purposes. Most games in the past have been restricted to serve educational ends; presently an increasing number are designed for research and business planning as well. Although the emphasis will differ from one game to another, few if any games are confined to research or business planning alone. It seems legitimate to expect a growing specialization in this regard in the future although there will always be a market for multi-purpose games, if nothing else for economic reasons. Another useful way of distinguishing among the purposes of games is based on the subject matter vs. the process of decision-making. A majority of games focus on subject matter exclusively; none neglect it completely. General management games incorporate a more or less well-balanced mix of the major functions of the business, such as marketing, research and development, finance and production (less often: procurement, employee relations). A vital purpose of these games is to provide an overall perspective and to improve the "feel" of the players for the interrelatedness of the various functions. On the other hand, functional games, of which marketing games are perhaps most typical, are confined largely to problems within a relatively narrow area. The game designers make some effort to relate the function in question to other aspects of the business; often this part of such games seems rather artificial. The inherent advantage of functional games is that they can pry far deeper into the particular function than is possible in general games of corresponding complexity. With reference to subject matter there are also a number of highly specialized games at the subfunctional level, devoted to such problems as production scheduling, inventory control or the logistics of the firm. Frequently the purpose here is to train the students in a specific problem-solving technique, such as the application of a given inventory control formula. As far as we know, no management game as yet has been designed to concentrate on the process of decision-making to the extent of making the contents of decisions a secondary matter. While such an emphasis can certainly be achieved in non-competitive simulations, and has been characteristic of group-dynamics research involving competition between somewhat task-oriented small groups, we frankly doubt the feasibility of building a reasonably realistic management game involving the simulation of competitive interaction between firms where the decisions as such become a marginal matter. Nevertheless, a few highly complex management games -- Carnegie Institute's revised detergent industry game and INTOP primarily come to mind -- do give considerable emphasis to organizational, human relations, information-handling and decision-processing factors. The two games mentioned permit the game administrator, by various devices and incentives, to shift the relative emphasis between contents and process from one play to another. The very nature of these games ensures, however, that teams will give more than nominal attention to both of these matters at all times. We do not doubt that this attention to organizational factors heralds a trend in management games of the future. Games may also be distinguished by the level or levels of management where decisions are being simulated. By and large it is true that general games are also top-management games, while functional games aim at middle management and the more specialized subfunctional games at the middle and junior management levels. Ceteris paribus, most complex games may encompass a broader sample of the management group horizontally and/or hierarchically. In some of these games, such as INTOP, each team may be given freedom to decide exactly what parts of the management structure of the firm the team should include, when such discretion is in line with the purpose of play. Many games, notably at the functional and subfunctional levels, are designed for each participant to represent an individual decision-making unit. In what is probably a majority of games, however, group decision-making is the rule. Very often the internal organization of the group is prescribed; in other instances the structure of decision sheets and output data itself is deliberately or inadvertently geared to result in a given internal organization. As was suggested in the discussion of the specific purposes of games, instances where organization problems have been made a principal element of the game are as yet fairly rare. Management simulations in the form of gaming by definition are competitive. Games that attempt to reproduce the dynamics of an industry or a market are almost always interactive. Games about scheduling problems or specific administrative techniques often are non-interactive, that is, the players vie for the best score independently of each other as in bowling. Like the golfer, a player of such a game can also compete against his own best prior score, or struggle to achieve or exceed some standard set by the game designer. Most everyone seems to feel that the game designer should strive for the highest degree of realism possible within the confines of his resources. At the risk of provoking protest we submit that in the matter of realism there is nothing the best manually administered game can do that the best computerized game cannot do, but that there are many things a computerized game can do that a manual game cannot do (at least if we wish the play to take less than a lifetime). A customary representation by proponents of manual games is that these games can be made to incorporate a certain sensitivity, a degree of personal judgment and an adaptation to the particular circumstances of a given game play, something which they say computerized games can never aspire to. To the extent that this is an invocation of romanticism rather than realism the argument is irrelevant here. What counts is that a good computerized game allows for the feeding-in of as many judgmental factors, acts of God and changes in the overall environment as it pleases any individual administrator of the game to introduce. To take but one example, the MIT Marketing Management Game as well as INTOP have built-in optional provision for the judgments of experts of such matters as the quality of advertising text and layout, the efficacy of product improvements, etc. Bank-loan applications may be passed on in a personal way rather than by the computer, if desired. Strikes, slowdowns, currency revaluations, tax and tariff rate changes and the emergence of competition from substitute commodities are additional examples of major change in environmental parameters which have found use in INTOP. Within the area of reasonable relation to realism, sophisticated computer games can make fully as much use of the initiative and personal judgment of the administrator as any manually administered game conceived thus far. In addition, the degree of realism in simulating complex situations can be made appreciably higher in computerized games. These can incorporate scores of variables where the manual game has to stop at a few or a dozen. And what is more, these variables may be represented by functions which very often are manifestly superior to those used in manual games. Manual games are confined largely to linear functions or random number tables and ad hoc judgments due to the considerable effort involved in figuring out the results of dynamic interaction among even a limited number of variables. In some respects the difference is analogous to that between chess and ticktacktoe. What has just been said is in no way intended to disparage manually administered games. Such games do possess a very great advantage in that the cost of running them typically is quite modest, while computerized games -- if machine time is calculated on a commercial basis -- usually involve hundreds of dollars in machine expense. The latter type of game also requires access to a computer, which may be a physical constraint, although not so when play is intermittent rather than continuous as is increasingly the case. For many specialized purposes manual games will be superior, for the excellent reason that the type of interaction simulated is quite simple. In many cases the purposes of game play can also be achieved with but modest degrees of realism, making the use of a manual game natural. The frequently voiced claim that in order to become a good user or administrator of management games one must first build one makes as much sense as the notion that the good driver is the one who built his own car. The arguments advanced in favor of this view are that "game design itself is an extremely valuable educational experience for the instructor or trainer," that feedback between cohorts of players may render a game useless after a number of runs at a given institution and that only by designing his own game will the instructor be certain that it will actually suit his purpose. The emergence of the do-it-yourself gospel in this area should also be seen against the background of the fact that few really usable game-administration manuals have been published in the past (none for a computerized game at the time of writing) and from the lack of availability of good games until very recently. It is a stimulating experience to design games. But the costs involved almost surely outweigh the personal educational benefits accruing to the designers. True, a simple manual game may be designed and broken in within a few months, but its educational value to the designer is also limited. We doubt very much whether a sophisticated computerized game on the scale of the Carnegie or Chicago simulations can be built and brought under control for less than $30,000-50,000, including at least one man-year each of senior manpower and programming assistance and considerable computer "debugging" time -- this despite the fact that future designers will have the benefit of the publication of both of these games. The problem of feedback between different cohorts of players is of practical significance with regard to quite simple games in which the most successful strategies may be easily deduced. Such feedback is also a problem in complex simulations with a rigid model, or in which the resetting of parameter numbers is troublesome. On the basis of personal experience we may say that a simulation which is both complex and flexible -- such as INTOP -- literally presents no such problem. In the past most management games have been single-purpose in character. Even so, there are scores of marketing simulations, dozens of general management games, etc. Unless the prospective administrator wants a simulation which actually attempts to replicate a specific real-life situation with "high fidelity" (likely to be a very costly proposition) there is at this time quite a broad range of choice. Furthermore, a game like INTOP, which was conceived as a modular multi-purpose simulation from the beginning of the design effort, allows each user to restructure the simulation to serve any given purpose within very broad limits, as demonstrated in Chapter 6 of this work. Even if it seems quite unwarranted to encourage each potential user of management games to design his own model a discussion of certain aspects of game construction may still serve a useful purpose in suggesting to a potential user the criteria which he may apply in the selection of a simulation and to the designer in spe some basic questions he will encounter in his venture. The present section has been written with these considerations in mind? Management simulations never give a perfect portrait of reality. No matter how intricate the computer equipment used, the picture is always impressionistic, both as regards the traits of reality incorporated and their relative emphasis. In effect,simulations tend to reflect the biases of their designers. This is of little concern if all the designer wants to do is to teach the players how to apply a narrowly specified technique, such as a formula for inventory control in a given situation. Often the problem of bias will also tend to become smaller the more complex the game: the more the number of variables increases, the less the likelihood that undue emphasis (or de-emphasis) of any one of them will unduly affect the game or the players. Judging by our own experience (which of course also may be biased), the problem is apt to be especially serious at the intermediate level, i.e., in games purporting to represent the whole or at least a major part of a management function, such as marketing or production. Most designers of marketing games seem bent on teaching players the lesson that in the modern economy price variation, and notably price cutting, is (or should be?) a secondary competitive instrument. A given investment in advertising, selling effort or R &amp; D almost invariably yields greater returns than a corresponding price cut. The problem of bias is one which we shall probably never be able to eliminate completely as long as it is possible to interpret reality in different ways. Honesty, and ultimately the faith of the game users in the value of games, requires that designers drop their false pride or pretense of knowing-it-all and openly state their biases. Where this cannot be done without furnishing players with too many "leads," the simulation should probably be redesigned. The next best thing is to present game materials against a background discussion of the assumed underlying "realities" rich enough to enable thoughtful players at least to derive the biases involved by indirection. It is usually assumed that game designers should aim at incorporating the greatest degree of realism possible in their models. But what is meant by realism is far from clear. Objective realism is one thing, verisimilitude or subjective realism another. The degree of objective realism need be no greater than called for by the purpose of the game. If the aim is to simulate the distribution of plumbing supplies for groups of executives in the plumbing industry a very high degree of realism is called for, or the game will presumably not teach participants very much. If the aim is to display the fact that the different managerial functions are interrelated in any firm, or to provide a view of problems in international business operations, the criterion of objective realism demands no more than that the variables and problems selected are interrelated in a meaningful manner and that they represent the types of functions, data and situations encountered in zeal life. Indeed, when the purpose is general, undue anchorage of the model in the details of a specific industry, or specific parts of the world, may cause disputes about institutional facts and relationships of no real consequence to the objectives of the game and very well may divert the attention of the participants to peripheral matters. In other words, objective realism may be too great as well as too small. Before leaving objective realism, we should emphasize the importance of avoiding what is clearly unrealistic. Any game designer knows that this is easier said than done. An example of what we are referring to apparently occurred when an IBM marketing management game was demonstrated to Midwestern universities in Chicago in the winter of 1961. It turned out that this version of the IBM game did not have a redistribution function, i.e., when a firm ran out of inventory no customer was ever assumed to turn to another supplier. Having found this out during a series of unfortunate decision periods, a team decided to "spoil the game." It proceeded to cut prices to the bone, thereby attracting most of the customers in the market. The team was unable to supply their trade, but every other team was stuck with giant inventories. As one might expect, a downward spiraling of prices set in, but the sabotaging team always cut deeper. When the session was called off, all teams were on the road to bankruptcy. To be an effective learning device, games must stimulate involvement among participants. Experience as players and administrators of games prompts us to say that a sine qua non for involvement is verisimilitude. If the players are not subjectively convinced that the simulation is reasonably realistic, they are apt to believe -- rightly or wrongly -- that nothing good can come out of it. Thus, in a conflict between objective and subjective realism, the game designer faces a delicate choice, especially where an aim of the game is to impart a new image of reality. Reality is frequently more "fantastic" than the average person's perception of it. Minor elements of subjective unreality are not likely to bother participants. Indeed, they may give rise to discussions about the nature of the corresponding reality which in themselves may be quite rewarding. A popular notion about management games is that simplicity is a virtue per se. We are far from convinced that this is true. If the simplicity is too great dysfunctional behavior on the part of students may be generated. An attitude of "beat the game" may easily become rampant. And while we love to speak of the simplicity of nature, the realities of modern business are indeed far from simple. We should avoid conveying the impression that most of its problems can be reduced to a few equations. Simplicity, then, is worth striving for only as long as it does not conflict too sharply with realism and other design criteria. Simplicity as such is most clearly out of place in simulations which aspire to make participating groups grapple with the problems of internal organization in a reasonably realistic fashion. Unless there is sufficient complexity to really warrant internal specialization and division of labor among the teams, game designers should avoid any pretense that their creations are suitable for organization simulation. The objective reality intended to be simulated in a game frequently calls for great degrees of complexity. Sooner or later the designer will run into diminishing returns along the complexity axis, however. Funds may become a bottleneck (and complex games are expensive to design). Available computer equipment will often impose constraints. Scarcity of knowledge concerning the nature of interaction in a system is apt to grow with its complexity. Not least is the limitation of playability. Playability is a relative concept. Over-complexity (or other negative influences on playability) may initially only manifest itself in a deterioration of the quality of play. When the quality of play is poor enough to warrant ruling the game as not playable is a matter of judgment. The prior background knowledge of participants and, importantly, the time allowed for decision-making, are other important determinants. Complexity may evidence itself in game rules, in the structure of decision forms, in the simulation model itself, in the number of decisions to be made and in other ways. Interestingly, if the number of decisions normally made each decision period is taken as a criterion we find that complexity, too, is a highly relative matter. It is true that in some well-known games players are held to half a dozen or some similar given (and fairly small) number of decisions. In the Carnegie game, on the other hand, a team may make as many as 300 decisions in a given period -- although a viable operation may frequently be conducted on the basis of a third (or less) as many. The INTOP simulation goes one step further, in that there is actually no limit on the number of decisions a company may make in any one period. Again, a team may survive by making one decision every quarter: that of reinvesting its capital and earnings in government bonds. In the Carnegie and Chicago simulations each team may actually settle for the degree of complexity in its operations which seems most suitable or challenging to it. The relationship between complexity and playability is a multifaceted one. For instance, it is frequently possible to simplify the rules of the game, or the forms on which teams record their decisions -- and hence increase playability -- by using more complex computations. Conversely, features of the game model as well as the amount of computation may sometimes be simplified by using more elaborate rules and forms thereby tending to decrease playability. The existence of risk in an objective sense and the prevalence of uncertainty in a subjective sense in business is well known. The incorporation of risk and uncertainty in management games is highly desirable. In some games this is done by the introduction of random or stochastic terms. Sometimes game administrators will add in such major changes in the "givens" of the game as strikes, tax increases, etc. with varying degrees of advance warning. All this is probably to the good. It must be remembered, however, that even games which are in fact strictly deterministic may "still present an apparently uncertain situation to the players, since the consequences of identical decisions by one firm may differ from period to period" due to competitive actions, the progress of business cycles, etc. In practice, the game designer has to walk a tightrope between the legitimate demand of the players that they be able to see some cause-effect relationships emerging from their decision-making endeavors and the realities of risk and uncertainty. Whatever the balance struck, any good game should point up the value -- and cost -- of obtaining information reducing critical uncertainties. Typically, this is done by providing teams with the opportunity of buying different types of market research data or consulting services, by allowing subscription to a periodically appearing trade journal and by furnishing annual reports of competitive companies. "The decisions generated in gaming are based entirely on quantitative criteria, and this, of course, is very unreal. In gaming, each company's marketing dollar is just as effective as every other company's marketing dollar, and each employee is as good as every other." Being typical of much criticism of management games, this half-truth leaves much to be desired. First of all, it overlooks the deliberate inclusion of uncertainty in virtually all games. Further, the second part of the statement overlooks the fact that several modern games include an "effectiveness factor," which may vary the return on a marketing dollar, for instance, according to the relative judgment of a set of advertisements or sales-promotion plans by an outside panel. To assume that each employee is as good as every other is probably not unrealistic when the average skill of thousands of lower-echelon employees is considered. As far as participants in the games themselves are concerned -- whether they play individually or in teams -- the statement is plainly not true. There are really no other limits on the introduction of qualitative elements in good game models than the imaginativeness of game administrators, the reasonable demand that some semblance of cause-effect relationships be preserved and the ability of participants to react to the changes introduced. It is a different matter that these possibilities have not been used nearly enough in the past in most games. Simulation involves interaction of the variables in a system over time. This dynamic aspect of management games is their unique asset in relation to most other educational instruments. In order to provide feedback from the interaction to the teams and afford them an opportunity to make new decisions on the basis of the data received, game play is generally divided into "decision periods" (in some respects corresponding to accounting periods in real life). The determination of a suitable period generally offers no great problem; the most common period simulated by one set of decisions appears to be one quarter. Frequently, of course, the amount of time it takes for a decision to become effective or for a process to be completed is longer. Plant construction may take two or three years, bank loans may be amortized over five or ten years, etc. As games are typically played only for eight to twenty periods, some long-range phenomena often must be shortened, i.e., the plant may be ready two or three quarters after the decision to build it was made. No serious criticism has been launched against game designers taking this type of liberty with Father Time. Certainly, the inclusion of such long-range decisions emphasizes the dynamics of games, and hence the need for planning on the part of the teams. As every game model represents a compromise between such different criteria as realism, playability, easy administration and easy computation of results, it is inevitable that any game has certain weak spots inviting manipulative behavior on the part of some or all players of a type that would not be possible in reality or otherwise is alien to the purpose of the simulation. The existence of major deficiencies of this type often will generate an attitude of "beat the computer" or "blow up the game" among some teams. The emergence of the former attitude is guarded against most effectively by designing models complex enough not to place a premium on the raw mathematical skills of some players. Propensities to try to blow up the game usually emerge when a team suffers from what they consider an "unfair" impact of a design weakness. While the designer cannot prevent self-destructive behavior on the part of one team, it is imperative that models be designed so as to prevent that team from spoiling the game for others. Of special importance is an incessant drive to minimize the probability of results being affected by clerical errors, whether they originate with the players or with administrative personnel. While the average participant will take such tribulations in his stride, personal experience and observation prompts us to emphasize that even a fairly modest error may completely demoralize a team which for some reason or other lacks spirit. The elimination of sources of error is one of the reasons why a new game should never be played in public until it has been subjected to several experimental runs. The number of teams in a game is largely predetermined by its purpose and the model itself. Manual games are generally restricted to a dozen teams or less, due to the computational problems encountered with great numbers of teams. Computer games using relatively simple models have been known to accommodate upwards of one hundred teams. With growing model complexity the maximal number of teams even in computerized games tends to be fairly limited. The original Carnegie Tech model as well as the MIT game, for instance, permit only three teams, and are thus necessarily confined to an oligopolistic market. The current version of the Carnegie game will accommodate six teams. In spite of its high degree of complexity INTOP may be used with up to 25 teams. The maximal number of members per team depends largely on the complexity of the game and the time available for an effective organizing effort and intra-team communication in decision-making. The AMA game is known to have been run with up to 15 members per team, which seems to constitute the upper limit so far. Four to seven members is quite common in computerized games, and up to half a dozen members have been used to advantage in manual games. INTOP has been run with a standard complement of four to seven members per team, but experimental runs will be made with two or three times that number; the INTOP model would seem to lend itself to perhaps greater division of labor than the AMA game. Herbert A. Simon pointedly speaks about a "Gresham's Law of Administration." In the absence of concerted effort to the contrary, routine matters tend to steal the attention from major policy problems, and short-range planning tends to push out long-range. Valid in real life, this observation is also quite relevant in the game situation. If there is any merit in the general notion of "professional management" (and we are assuming there is), management games should certainly emphasize the importance of long-range planning. At least two important implications would seem to follow. First, the number of derision periods in a game run should be great enough to permit the teams to establish a working organization (a few periods of shake-down may be desirable), to get their teeth into long-range planning and to see the fruits of it. This requirement speaks in favor of at least eight to ten decision periods. If available time is at a great premium, there are various possibilities of "telescoping" some periods. This need not necessarily be a loss in learning experience, as telescoping decisions without intermediary feedback of results effectively forces teams to think in terms of policy decisions. At the other end, no serious effort has been made to our knowledge to establish at what number of decision periods diminishing returns set in. As far as we know, no complex game has been played with an identical complement of teams for more than twenty distinct decision periods. Presumably, the optimal number of periods will vary with the characteristics of both the individual participants and the game being played. Second, we feel it quite vital (in apparent contradistinction to most game users) to emphasize that the game play actually simulates but a brief span of time in the life of modem, presumably perpetuate corporations. When action potential for the future at the termination of the game is held out as an important criterion of performance, it is our experience that players will not sacrifice long-range objectives for short-range advantage. Broadly speaking, the time available for making decisions during each period of play during a game run should be related to the complexity of the game. In practice, one finds in use periods ranging from a few minutes to two hours or more. Other circumstances being equal, formal decision periods may be shortened if participants are given the opportunity to prepare the groundwork for decision in the time between game meetings. This presupposes intermittent rather than continuous play. A popular notion among game administrators, notably those who propound the virtues of continuous play, is that decision periods should be made short enough to subject the players to considerable time pressure. In our view, this is a highly dangerous generalization. It should be clear, for instance, that where groups rather than individuals play the game, there should be ample time in the early part of the game for the teams to solve their organizational problems. If long-range planning is going to be more than a pipe dream, teams must be allowed at least periodically to set aside some considerable time for this purpose. Also, we are really averse to the idea that decision periods should "normally" be short enough to put the teams under duress -- the notion that most real-life business decisions are made under such conditions is far from convincing in the absence of more tangible evidence than we now have. And even if this were so, it is far from self-evident that normal training conditions should be made to simulate this particular aspect of such a reality. It is an entirely different matter that occasional drastic restrictions in available time for decision-making may serve a very worthwhile purpose. Clearly, some business decisions are made under duress. Also, such abbreviated decision periods, especially if introduced without prior notice and comparatively late in the game, may serve a purpose as one type of test of the viability and efficacy of the internal organization among the teams. By this time the reader should be able to perceive that we are somewhat skeptical about game sessions involving continuous play. We feel strongly that the value of complex games is reduced rather severely if there is no time intermediary between decision meetings. This is not merely because a serious application of analytical techniques to intricate data requires more time than a formal decision period is likely to afford. Even more important, in order to digest voluminous data, gain an overall perspective and acquire a sense of the interrelationships between the whole and its parts the average participant needs time for personal and unhurried reflection. We are convinced that much of the learning experience is lost if this process is frustrated. There is less objection to continuous play in quite simple games. However, many such sessions witness the emergence of an artificial supercompetitive spirit and a steamed-up emotional atmosphere which may actually hamper the educational process. Limited time and other constraints may occasionally force the use of even some of the most complex games in continuous play. This may be better than playing no game at all, but it must be understood that continuous play has serious shortcomings. We confidently predict a gradual shift in the field in favor of relatively greater use of intermittent play in the future. How long should the period between decision meetings be? Experience to date suggests no hard-and-fast answer. Even in highly complex games teams are certainly capable of formal decision meetings once or twice a week without strain, provided that the administrator can furnish output data a day or two in advance of each session. Furthermore, it is quite feasible to accelerate the dynamics of play by requiring decisions for two (or at times more) periods at each meeting without any intermediary feedback. Finally, it should be pointed out that intermittent play makes it perfectly feasible to arrange gaming by mail. This has already been amply demonstrated in INTOP as well as the UCLA and Pitt-Amstan games. To facilitate mail play, game administrators frequently resort to a technique known as leapfrogging. This simply means that teams in period t make decisions on the basis of output data from period t -- 2, while decisions for period t -- 1 are being processed. There is nothing extraordinary in this process, as businessmen in reality often have to make decisions on the basis of uncomfortably dated information. Indeed, the use of leapfrogging frequently seems to provide an extra spur to long-range planning. This, at least, was the reaction of a team of executives in Stockholm, Sweden, participating in a regular INTOP class run of the Graduate School of Business at Chicago. The Chicago teams were making their decisions on the basis of current output, but due to the limitations of the transatlantic mail system the Swedish team had to practice leap-frogging. Nevertheless, in terms of profitability and other conventional criteria of success the overseas company wound up in fourth place among fourteen teams. It may be observed that leap-frogging has also been used in continuous play (for example by George J. Feeney in administering the General Electric Marketing Game) as a means of providing for flexibility in what in such play may otherwise become a very hectic processing schedule. Rapid feedback of data in cases where processing and play take place in different localities will be promoted by the Dataphone System and even more advanced techniques for high-speed data transmission over great distances presently under development. These devices are likely to promote more widespread utilization of computerized games of a sophisticated nature. That half of the value of the game lies in the post-mortem evaluation session is still a widely held notion among practitioners. Again, our experience prompts us to differ. Many evaluation sessions -- notably after games with one or two days of continuous play -- are in fact no more than supercharged exercises in the post-rationalization of team behavior. This especially tends to be the case where most or all participants are employees of the same company in real life. We are certainly not arguing against postgame critique sessions as such. But we are suggesting that these sessions, if they are to be really rewarding, place great demands on teacher as well as students, and that even a well-run review session plays a relatively modest role in a well-balanced game. The prime learning in a dynamic educational situation is -- or should be -- "in the doing," that is, in the making of decisions, the observation of their results and the immediate analysis of cause-effect relationships. Thus continuous review should be emphasized as an indispensable part of the system, as indeed it is in well-organized real-life decision-making. In addition, provision may be made for periodical longer-term reviews, preferably involving comparison with other teams. Such discussion may be stimulated, e.g., by distributing to each team "annual reports" of all other teams and setting aside special time for their analysis. The administrator or outside experts may assist further by auditing and counseling activity. The learning experience in management games may be enriched very considerably by a great array of activities which go beyond the straight play of the game but are closely integrated with it. Many such activities which have been tried out with INTOP are discussed in Chapter 4. Here we shall only give a few illustrations. An important exercise stimulating policy thinking and long-range planning is the formulation of decision rules for several periods at one and the same time. These policies may pertain to all decision areas in the simulation, or only to certain aspects (such as marketing in general or advertising in particular in an overall management game). The teams may be permitted to make tentative policies or obliged to define rules which in effect bind them for a certain number of periods; the rules may be made unconditional or conditional upon the attainment of certain intermediary results, etc. This is a highly promising frontier area in game development. Games offer a wide field of application of analytical techniques. Students may be asked to apply various types of rate-of-return, direct costing, break-even and cost-of-capital analyses. They may be required to submit sales forecasts and cash budgets and explain how these were derived. Often statistical and mathematical methods and marginal economic reasoning may be useful. Cash flow, sources-and-uses-of-funds and other worksheets and statements may be prepared and so on. The importance of flexibility and creativity can be stressed, and player sensitivity to changes in the institutional environment may be increased, by the introduction of special incidents manifesting themselves in terms of change in basic game parameters. We are thinking, for instance, of new legislation, evidencing itself to the players in such forms as lower taxes, credit restrictions, tariff increases, etc. Strikes may be declared, certain plants destroyed by acts of God, mergers between teams permitted, substitute products may emerge and severely restrict the market available for the product(s) involved in the game, or conversely, that market may suddenly expand violently as new uses for its product(s) are found. There are few practical limits to the amount and types of change which may be incorporated into a well-built model of the more ambitious variety. The feeling of realism as well as the quality of the learning experience may be increased further by calling in experts for review and counsel. For instance, auditors may undertake a management audit; a banker may pass on loan applications; and outside executives or faculty members may be invited to serve as members of the board of company teams. We know little about the effectiveness of management games as an instrument of education. Indeed, we do not even know for sure how to distinguish a good game from a bad one, although it is believed that the discussion in earlier sections of this chapter provides certain bearings in this regard. All this is certainly disturbing, especially in view of the appreciable costs involved in the design and use of at least more complex games. Yet our high degree of ignorance is hardly surprising in view of the fact that such simulations have been around for less than a decade. It is really a good deal more disconcerting that we know so singularly little about the effectiveness of the case method, of group discussions, of role playing, of the in-basket test and of other educational techniques which have been around for quite some time. Indeed, we know precious little even about the efficacy of the classical lecture, beyond the fact that students can be made to feed back selected parts of it on tests. We shall not here go into a detailed discussion of the vexing problems of gauging the effectiveness of educational instruments. Clearly, the measurement effort in business education has to proceed on two levels: the effectiveness of instruments in contributing on one hand to the standards established by educators as regards student knowledge and abilities and on the other to student performance in real-life business positions. The problems on the first level are bad enough, on the second they are truly exasperating. To begin with, we have not even cleared up the basic question as to how much native characteristics count in relation to acquired talents and environmental influences in conditioning a successful business leader, although psychologists and other students of leadership with each new volume seem to be placing increasing emphasis on the latter groups of factors. Even if we have a firm idea about the role of inculcated know-how, the pivotal question remains how we go about ferreting out the significance of any one educational (or practical) experience from the aggregate. And many relationships are bound to be of such a long-range and indirect nature that they will be very hard to establish in practice. With regard to the effects of games specifically what spurious evidence we have at this time emanates largely from preliminary studies undertaken by Dean William R. Dill and his colleagues at Carnegie Tech. It seems to suggest that there is little or no correlation between success in the CIT game measured in terms of accumulated profits (not in terms of quality, consistency, creativity of play or many other alternate criteria of superior performance which might be applied) and success in business (for which again a host of alternate criteria might be used). Also, there is no correlation between team averages in the Admission Test for Graduate Study in Business and team success in the game. But then, of course, we have no clear indication that high scores on the ATGSB predestines one to a successful career in management either. What seems to be reasonably clear is that what students get out of management simulations differs in nature from what they get out of other means of learning. B. Games Compared to Cases, ETC. In a nutshell, a business game is a dynamic and live case. While a case of the traditional type provides an essentially static snapshot of a business problem situation, the game yields a moving, multidimensional picture. Even more significant, perhaps, is the fact that in games the students have to live with their own decisions; they are personally forced to take the consequences of their recommendations. Feedback and re-enforcement as means of supporting the learning experience are relatively minor elements of the case method, but are indispensable, built-in concepts in a game. In a play, the author and the actors are not trying to extend the experience of the audience by presenting useful facts about the world. Indeed, many of the most forceful and effective dramas involve events and surroundings that are totally unrelated to the day-to-day reality of the audience. A good play alters, not our experience, but the manner in which we interpret our experience. Old facts take on new meanings and future experience is seen with improved understanding. An effective play provokes insight. This is precisely the purpose of the strategy simulation exercise (a General Electric marketing game). In effect, the exercise is a play in which the participants are simultaneously the audience, the actors and, to a large extent, the playwright. This quotation in effect also brings out a basic similarity between gaming and role-playing. A main difference between the two lies in the fact that games involve role-playing over an extended period of time and, again, to a greater degree than customary in role-playing, force participants to accept personal responsibility for their behavior. A characteristic feature of games is that they almost invariably stimulate considerable excitement and personal involvement on the part of participants. As educators have sadly learned, this is not always the case with most other means of communication at our disposal. The question has even been raised that perhaps "too much involvement takes place in management games, and that, consequently, the individual cannot lower his defenses sufficiently to accept feedback from others in the group on the adequacy of his behavior, beliefs, feelings, or attitudes." Or, conversely, any teaching tool generating such a high degree of involvement "could be a very good way of getting the wrong things across." Our own observation -- not scientifically validated -- is that in a complex game extended over a considerable period of intermittent play a skilled administrator will usually not have too much trouble guiding involvement into constructive channels. To us it seems premature in that situation at least to start complaining about too much frosting before we know a good deal more about the cake, i.e., what other characteristics and effects of gaming are. Of course, games do have some limitations as compared to other items in the tool-kit of management development. As suggested, they tend to be costly. To be really rewarding it is probably always going to be true that they will have to be rather time-consuming. Even the more advanced games can only cope with one basic set of market or other institutional characteristics in the course of a given run, even if it may be changed relatively freely. It is true that in some game models -- including our own -- even drastic change in basic parameters is possible. But if the changes are too radical there is no longer any continuity, and cause-effect relationships in decision-making become too tenuous to provide for effective re-enforcement. The case method practiced over an equal amount of time offers the opportunity of greater variety in problem settings. Among other things, the effectiveness of a management simulation as a teaching tool depends on what the administrator is trying to teach with it and on the level of education or experience of participants. In the Pitt-Amstan Simulator game the intention appears to be to teach junior and middle executives how to make better management decisions within an environment which is held in a great many respects to resemble closely American-Standard operating conditions. Top management of the firm apparently feel that this is being accomplished, and somewhat similar experiences are reported concerning the AT &amp; T Financial Management Game and Boeing's Operation Interlock. Doubtless it is also true that highly specialized games can make participants become better production schedulers, sales forecasters, etc., within the specific framework simulated. Nevertheless, we venture the opinion that in the area of functional knowledge and ability games will continue to contribute mainly by "dramatizing the concepts of management and making them more graphic and concrete and, thus, more understandable." In a majority of games the problems of the general area of management portrayed and their broad interrelations will be emphasized, rather than specific institutional facts. Ample opportunities of finding applications for analytical techniques of a general nature (marginal reasoning, cost-of-capital analysis, etc. ), rather than specific formulas, will be increasingly emphasized in these games, and we may fairly expect greater proficiency in the practical use of such techniques as a result. There is no doubt that a good management simulation can present a holistic view of many seemingly disparate functions in a business. Evidence also exists to indicate that many participants for the first time get a real feel for "the Big Picture" in a firm's operations by playing an advanced game. A good simulation does not fail to demonstrate the ever-present problem of suboptimization in all organizations. In an increasingly specialized and complex economy this effect of games would seem to be welcome. There is similarly evidence to support the view that if executives are deliberately given assignments in the simulation not corresponding to their real-life positions, this may indeed help them to acquire a better understanding of the problems of people working in other functions or at other levels of management. They may also acquire a better view of how their own job meshes with the contribution of others -- and vice versa. This effect of games is worthy of further exploitation as well as exploration, as the main emphasis in many executive development programs is to bring about a change in attitudes rather than to impart new knowledge. Complex games which really require an effective group decision-making effort for successful participation by necessity subject participants to an organizational and human relations experience which in some cases may be quite substantial. In considering alternate means of organizing the team effort -- whether to emphasize customer categories, geographical areas, products or functions and what degree of delegation to authorize, etc. -- executives participating in INTOP have frequently stated that they recognize very real problem situations from their own experience. Game participation apparently does sharpen diagnostic ability in identifying problems in the organizational area as well as regards the subject matter of decisions to be made. The opportunity of making a diagnosis of his own style of decision-making in a team and of upgrading his capacity to empathize, i.e., to understand the problems and attitudes of others, also seems to be seized upon by many players. This is also true with regard to the opportunity to practice bargaining skills built into INTOP and a few other games. Some games at least also seem quite effective in teaching participants the value of planning -- and notably long-range planning, an area in which many real-life businesses still seem to have a hard time going from sounds to things. That intelligent planning requires a well-organized flow of data is also made clear. Complex games further teach the necessity of being selective, of focusing not on all data but on data relevant to given decisions. Almost all games worthy of the name point up the importance of competitive intelligence of a systematic nature. In view of the great deficiencies in this area existing in business today, many a game may be worth its salt merely by bringing out this particular point. Computerized games provide an experience of participating in man-machine systems in general and living with computers in particular. They manifestly serve to stimulate the interest of participants in simulation as a general technique of attacking management problems. Today we are confined to speaking largely in terms of the initial effect rather than the ultimate effectiveness of simulations as means of preparing people for management jobs or improving their performance in present positions. What we already know about initial effects should definitely encourage their further use, especially in combination with other educational techniques. Meanwhile, research efforts directed toward establishing the effectiveness, as well as the possible dysfunctional aspects of management games, should certainly be accelerated. We shall conclude the chapter with some remarks on the role of simulations in management education, whether in industry or at schools of business. Games should be viewed as representing one of many educational tools, each of which have properties which are in part unique and in part overlapping with the characteristics of other tools. Many individual educators, and indeed entire business schools, will associate themselves with a particular tool almost to the point of exclusion of all others. Witness, for instance, the extraordinary faith placed in the case method at the Harvard School of Business Administration at a time when that School exercised a more dominating influence over American business education than at present. It is probably true to say that the current is now in the direction of a more relativistic view of all tools, a view forcefully supported by the Pierson and Gordon-Howell reports on the education of businessmen. The trend unmistakably is toward the parallel use of several teaching methods, a balanced portfolio of educational tools. A crucial point of view in this context is the integrative one: where several methods are used they should re-enforce each other rather than be permitted to take off in widely divergent directions. Integration may be achieved in various ways. By way of illustration, teachers at the Graduate School of Business at Chicago have used INTOP as well as revised versions of the Andlinger and the UCLA II games in individual courses in combination with lecture-discussions and written assignments. At the Carnegie Institute of Technology a different route has been chosen in that the CIT game is given as a distinct "course," but with many tie-ins with standard courses in finance, accounting, marketing and so on. At both institutions, as indeed in a number of executive development programs in industry, educators have found that an advanced management game may serve as a convenient and stimulating focal point for broader discussions of theory as well as a source of golden opportunities of applying specific analytic techniques. Management game situations have also proved singularly well suited to the application of role-playing and in-basket exercises. How integration is brought about is probably less important than that some substantial degree of closure is in fact achieved. Evaluation of performance in any management simulation depends, of course, on the purpose of that game and the circumstances under which it is being used. Generally speaking, it is true that the more complex the simulation the greater the problem of evaluation. Criteria of "success" become increasingly numerous, and the importance to be assigned to any one of them increasingly controversial. The fact that this is also a problem of real life is a source of some consolation. Our own feeling is that relatively little emphasis should be given to the general type of criteria which Wall Street analysts might apply in evaluating a concern. Such caution seems especially warranted in view of the fact that we know too little as yet about the determinants of success in these terms. "Winning the game," in other words, should not be a prime criterion. Greater emphasis may be given to the quality of play in terms of purposiveness of the team in striving for the goals established by itself, in terms of the internal and sequential consistency of its plans and decisions and in terms of the imaginativeness of its actions. This theme is further developed in Chapter 4, which also discusses the evaluation of individual participants in team play. Given this approach to evaluation it would seem entirely justified to make a certain part of the grade in a course or program of which the game is an element dependent on performance in the simulation (and any specific assignments relating to it) provided that this is clear to the students from the outset. In this way potential recalcitrants (of which there may be some even in management games) are also given an incentive to take an active part.